TFE Again Wins WeddingWire & TheKnot Awards! We WON again this year thanks to YOU, our couples! THANK YOU to all of our couples who put their trust in TFE to help make their Wedding a Real Celebration! 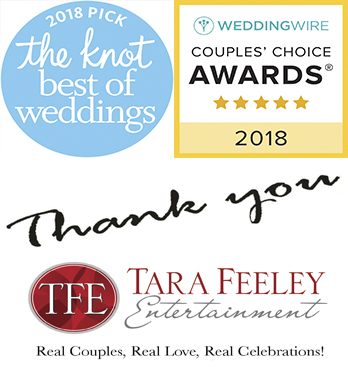 Each one of you who took the time to write a review of your experience with TFE on either WeddingWire.com or TheKnot.com is what helped us to get the honor of these awards. TheKnot.com awards the “Best of Weddings” Award. The award represents the highest-rated wedding professionals as reviewed by real couples, their families and wedding guests on The Knot. In 2017, only 2% of the 250,000 local wedding professionals listed on TheKnot.com have received this distinguished accolade. To determine the winners, The Knot assessed almost one million reviews from real couples across the various vendor categories—venues, musicians, florists, photographers, caterers and more. These winners represent the best of the best for wedding planning professionals that a bride or groom would want to consider order to inspire, plan and pull off their own unique wedding. WeddingWire awards the “Couples Choice” Award. The award recognizes the top 5% of local Wedding Professionals from the WeddingWire Network throughout the United States and abroad that demonstrate excellence in quality, service, responsiveness and professionalism. Unlike other awards in which winners are selected by the organization, the WeddingWire Couples’ Choice Awards® are awarded solely based on the reviews from over 1.2 million newlyweds. Awards are determined by a combination of excellence in four factors: overall rating (quality), total number of reviews (quantity), review performance from 2016 (recency), and consistency of reviews from year to year (consistency). Working closely with you to PERSONALIZE…not simply customize….your Wedding is how REAL Celebrations are made! And when you put your trust in TFE to help you create your one-of-a-kind Real Celebration, the end result is an unforgettable day full of great memories…both relived and made…for you and all your friends and family! And your online reviews which lead to awards such as these are proof! For that, we are forever thankful! We hope to see you on a dance floor soon!